This technical bulletin presents the new RosetteSep™ and SepMate™ system for fast, efficient and high-throughput cell isolation from whole blood samples. It features data from Dr. Ajay Jain’s lab at the University of Maryland School of Medicine, which used this system to reduce NK cell isolation time from four hours to a single hour for a 450 mL unit of blood. The movement towards more physiologically relevant assays based on primary human cells has created the need for a fast and efficient method of isolating immune cells from large numbers of whole blood samples.2,4 To facilitate this type of high-throughput cell processing, STEMCELL Technologies Inc. has developed a new system for rapid and efficient cell isolation directly from whole blood in as little as 25 minutes. The RosetteSep™ and SepMate™ system combines a unique immunodensity cell isolation reagent (RosetteSep™) with a specialized cell processing tube (SepMate™) to reduce the number of steps needed for cell isolation. This new system saves time, minimizes variability between users and allows efficient, high-throughput sample processing. It also minimizes the risk of activating or damaging cells by isolating untouched and highly purified cells without columns or immunomagnetic beads. Cells isolated with the RosetteSep™ and SepMate™ system are immediately available for use in a variety of downstream assays such as cytotoxicity testing, compound screening, and other applications where it is important to obtain viable, functional cells with minimal manipulation. Dr. Jain’s group found that isolation of NK cells was significantly faster with the RosetteSep™ and SepMate™ system: a 450 mL unit of blood could be split into multiple samples and processed in a single hour, compared to four hours using DGC/immunomagnetic selection (Jain et al., in prep). Furthermore, NK cells isolated by RosetteSep™ and SepMate™ were highly purified (86.7% as assessed by flow cytometry) with intact cytolytic function. Using in vitro assays, Jain et al. showed that isolated cells retain the capacity to kill HT9 colon cancer cells or K563 leukemia cells (Figure 1). Flow cytometric evaluation of NK cell activation markers demonstrated that NK cells isolated using RosetteSep™ and SepMate™ have similar expression profiles similar to cells isolated using DGC/immunomagnetic selection (Figure 2). Figure 1. In vitro cytotoxicity against HT29 colon cancer cells and K562 target cells with NK cells isolated by DGC/immunomagnetic selection (left panel) versus RosetteSep™ and SepMate™ (right panel). In vitro conditions include culture with media alone (open circles), 10 μg/mL human IgG1 isotype control (open triangles), or 10 μg/mL cetuximab (open diamonds). Figure courtesy of Dr. Ajay Jain. Figure 2. Surface expression of NK cell activation markers as evaluated by flow cytometry. Expression is shown as mean fluorescence intensity (MFI). Figure courtesy of Dr. Ajay Jain. The SepMate™ tubes… provide a mechanical barrier between the purified effector cells and the density gradient medium. The desired cell populations remain above the barrier and can be poured out of the tube with no technical expertise. This method allows for the concurrent rapid purification of NK cells and CD8+ and CD4+ T cells from multiple human donors, which makes downstream applications (i.e. flow cytometry, ELISA, assessment of in vitro cytotoxicity) more practical to perform in a high-throughput manner. – So et al., 2013. The RosetteSep™ and SepMate™ system allows efficient negative selection of lymphocytes from whole blood in a quarter of the time needed for an alternative method, requires no technical expertise, and yields fully functional cells. This new system makes it possible to rapidly isolate NK cells or other immune cells from many samples at once, facilitating high-throughput cytotoxicity testing and other downstream assays. Scroll down for more information on the RosetteSep™ and SepMate™ procedure. 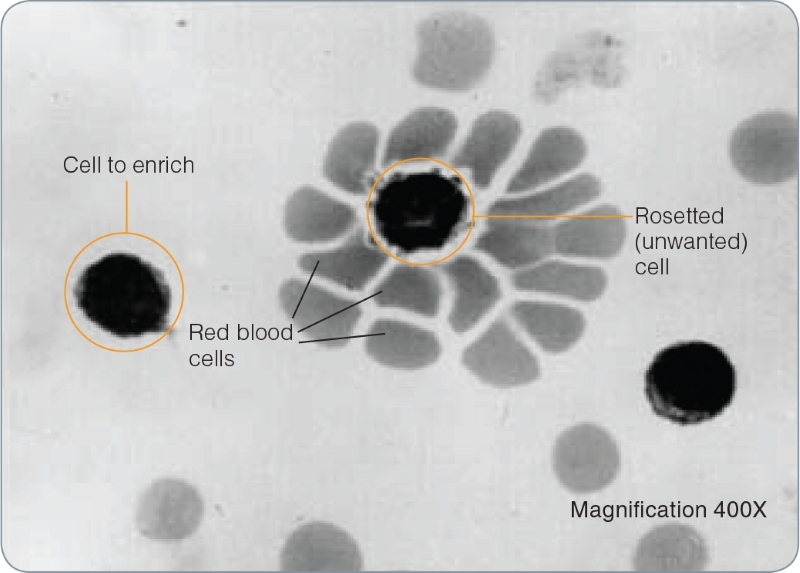 RosetteSep™ isolates highly purified cells directly from blood by crosslinking unwanted cells to red blood cells, forming immunorosettes (Figure 3). These immunorosettes pellet during density gradient centrifugation, leaving untouched and highly purified target cells at the interface between the plasma and the density gradient medium. Using the new SepMate™ tube makes the RosetteSep™ procedure even faster and easier. The SepMate™ insert creates a physical barrier between the sample and density gradient medium, allowing the sample to be rapidly pipetted or poured into the tube. Centrifugation time is reduced to just 10 minutes, and purified target cells can simply be poured into a new tube. SepMate™ can also be used on its own for hassle-free PBMC isolation from whole blood in just 15 minutes. Figure 3. Image of a blood sample after addition of the RosetteSep™ cocktail, and prior to density gradient centrifugation. FAST AND EASY. Isolate cells from whole blood in as little as 25 minutes with RosetteSep™ and SepMate™, or use RosetteSep™ on its own with standard density gradient centrifugation. NO SPECIAL TRAINING OR EQUIPMENT. RosetteSep™ and SepMate™ can be used by anyone with minimal training. No columns, magnets or other special equipment are required. HIGHLY VIABLE AND FUNCTIONAL CELLS. Isolated cells are functional, flow cytometry-compatible, and unlabeled with antibodies or magnetic beads. 1. For labeling 40 mL of blood. 2. For labeling 200 mL of blood. 4. This product carries the CE marking. 5. Can be added to a standard RosetteSep™ cocktail, if not already present, or used alone. 1. Fresh products currently available in the United States and Canada (excluding Quebec). Please contact Product & Scientific Support (techsupport@stemcell.com) for more information. 2. ACDA - Acid-Citrate-Dextrose Solution A; CP2D - Citrate-Phosphate-Double-Dextrose. 1. SepMate™ (IVD) is only available in select regions where it is registered as an In Vitro Diagnostic (IVD) device for the isolation of mononuclear cells from human whole blood or cord blood by density gradient centrifugation. 2. SepMate™ for Research Use Only (RUO) is available in regions where SepMate™ is not registered as an IVD device.